Although the relationship between vitamin D supplementation and wound healing has not been clearly established, we know that this nutrient is essential to maintain bone health. Vitamin D deficiency and insufficiency are very common and can have a negative impact on health and well-being. Reversing vitamin D deficiency is simple and inexpensive and has been linked to many health benefits. 1. Office of Dietary Supplements, National Institutes of Health. Vitamin D: Fact Sheet for Health Professionals. 2017. https://ods.od.nih.gov/factsheets/VitaminD-HealthProfessional/. Accessed September 21, 2018. 2. Regulski M. Addressing vitamin D in the wound clinic. Today's Wound Clinic. 2016;10(11). 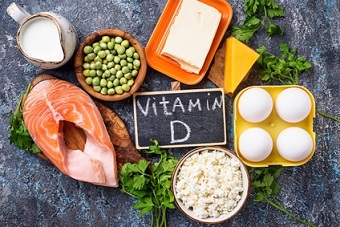 https://www.todayswoundclinic.com/articles/addressing-vitamin-d-deficien.... Accessed September 22, 2018. 3. Institute of Medicine Food and Nutrition Board. Dietary Reference Intakes for Calcium and Vitamin D. Washington, DC: National Academy Press; 2010. 4. Guo S, DiPietro LA. Factors affecting wound healing. J Dent Res. 2010;89(3):219–29. https://www.ncbi.nlm.nih.gov/pmc/articles/PMC2903966/. Accessed September 21, 2018. 5. Holick MF. Vitamin D deficiency. N Engl J Med. 2007;357(3):266–81. https://www.nejm.org/doi/full/10.1056/NEJMra070553. Accessed September 21, 2018. 6. Yuan Y, Das SK, Li M. Vitamin D ameliorates impaired wound healing in streptozotocin-induced diabetic mice by suppressing NF-κB-mediated inflammatory genes. Biosci Rep. 2018;38(2):BSR20171294. https://www.ncbi.nlm.nih.gov/pmc/articles/PMC5835716/. Accessed September 22, 2018. 7. Razzaghi R, Pourbagheri H, Momen-Heravi M, et al. The effects of vitamin D supplementation on wound healing and metabolic status in patients with diabetic foot ulcer: a randomized, double-blind, placebo-controlled trial. J Diabetes Complications. 2017;31(4):766–72. 8. Kalava UR, Cha SS, Takahashi PY. Association between vitamin D and pressure ulcers in older ambulatory adults: results of a matched case–control study. Clin Interv Aging. 2011;6:213–9. https://www.ncbi.nlm.nih.gov/pubmed/21966215. Accessed 9/21/18. Dr. Nancy Munoz is the Assistant Chief for Nutrition and Food Service for the Southern Nevada VA Healthcare System. Teaching healthcare practitioners the role of nutrition as a modifiable risk in the development of pressure ulcers is at the core of her practice. Dr. Munoz has authored and served as expert reviewer for books and manuscripts for numerous professional publications, and the Academy of Nutrition Evidence Analysis Library. She currently serves as the Professional Development Chair for the Dietetics in Healthcare Communities DPG, is a member of the Academy’s Positions Committe and the WoundSource editorial advisory board, and is the current Vice President for the National Pressure Ulcer Advisory Panel.